Director: David Lean. Cast: William Holden, Alec Guinness, Jack Hawkins, Sessue Hayakawa, Geoffrey Horne, James Donald, André Morell, Peter Williams, John Boxer, Ann Sears, Henry Okawa. Screenplay: Carl Foreman and Michael Wilson (based on the novel by Pierre Boulle). David Lean's The Bridge on the River Kwai centers around the construction of a large, sturdy, rustically beautiful railway, built by British prisoners of war across the Thai river Kwai. An even more astonishing feat of engineering and design occurs, however, over the course of this film. I refer to the magical process by which Lean and his colleagues somehow elevate what begins as a routinely, almost tiresomely chest-beating Patriotism picture into one of the most gripping and unsimplified statements the cinema has ever made about war, at least from among the films I have seen. If only Bridge were as compelling in its first hour as it becomes toward its climax, this picture could really have shot through the roof. As it is, what we have is a rousing mini-epic that deserves almost all of the attention it has retained since its premiere in 1957. The Bridge on the River Kwai begins in 1943, in a labor camp where the Japanese General Saito (Sessue Hayakawa) organizes hundreds of English, Australian, and American into the principal strategic act of creating the titular bridge. One of many lingering confusions that Carl Foreman and Michael Wilson, the long-blacklisted scriptwriters who only posthumously received credit for Kwai, fail to dispel is what the men did who occupied Saito's camp before this picture begins. The bridge effort only commences when a squadron of soldiers under the British Colonel Nicholson (Alec Guinness) arrives together under Saito's dictatorial hand. The Japanese general has no qualms about literally throwing the rules of the Geneva Convention into the dirt, and he has no intentions of excluding officers like Nicholson from the project of building the bridge. Nicholson's combination of the officer's respect for battle codes and the Brit's religion of propriety refuses to relent to this blatant flouting of international law. For his stubbornness, he and the rest of his officers are enclosed in extremely cramped, meagerly ventilated tin huts called "ovens" and kept in suffocating, unfed isolation forhow long, exactly? days? weeks?while the common soldiers start chopping lumber and mounting a scaffolding for the great labor ahead of them. Though Guinness of all the film's large cast bagged the largest share of critical acclaim, including the Best Actor Oscar of 1957, his in point of fact is not the largest role. That distinction belongs to William Holden, playing Admiral Shears, a U.S. Naval officer whose detention in Saito's camp has already been long-standing by the time Guinness and crew make their entrance. Shears stares at everyone and everything around him with the same cynical glower, the frown of a pessimist whose worst suspicions have been made reality. Several of his less disciplined colleagues in the camp persuade Shears to join their escape attempt at the film's beginning, though Saito has made quite clear how unnavigable and well-patrolled are the jungle regions on all sides of the camp. Shears' comrades are killed in flight, and the Japanese believe they have also shot Shears as he leaps into the Kwai, but we see his head rise above the surface just before the tide rushes him off to other shores. The incarceration of Nicholson and the self-liberation of Shears are the two events that set off the primary vectors of Kwai's plot: how Guinness' character comes to influence the camp's operations from the inside, and how Holden's is drawn back to the site as part of a commando outfit designated to blow up the bridge upon its completion. We do, as a result, require some introduction to both men as the film opens, but Lean and his screenwriters spend entirely too much time with these essentially expository chapters. Cinematographer Jack Hildyard, whose work is stultifyingly inert for the movie's opening half, indulges in far too many studious close-ups of the tin hut in which Guinness is enclosed, and editor Peter Taylor seems to have left none of them on the cutting room floor. A shot of the British soldiers whistling the now-immortal "Colonel Boogie March" lasts far longer than it needs to, save for the banner-waving value of showing how tuneful, how organized, how plucky these Limeys are even as they step into the forbidding environment of the camp. A later scene of Nicholson ushering his fellow officers out of the "ovens" likewise goes on for eons and eons, slathered in more brass-happy music that makes the emotion of the moment seem even more false and overblown than it already is as Lean films it. In other words, this Bridge doesn't seem headed anywhere for its first hour except right into the heart of fond Allied reminiscence. One scene that plays especially gallingly today occurs as Guinness takes his first tour of the construction site since having been freed from "the oven." He cannot believe or accept the listlessness with which his former men are working, and he can even less abide the shoddiness of their work. Just as his belief in code made him outraged at Saito's treatment of officers, so is his code of honor affronted when Britain's finest fighters allow their quality of work to deteriorate so markedly as prisoners of war; not only is such behavior dishonorable to the ethics of war captivity, by which prisoners are bound to work as hard and as well as they would for their own allies, but Nicholson envisions a bridge that will outlive the war itself and should one day be able to speak for the precision and proficiency of the British soldiery. Ironically, then, he assumes for himself the task of relocating, redesigning, and recommencing the plans for building the bridge, all with the sound advice and surprising alacrity of his men. What makes the sequence of his taking control seem bizarre, even outrageous, are claims such as those that the Japanese have proscribed to his soldiers "a lot of uncoordinated activity," and that they govern "with no order and no discipline." It's one thing for Lean to throw a lot of egg on the face of his country's World War II adversarybut really, when was the last time someone accused the Japanese of disorderliness or lack of discipline? "We can teach these barbarians a lesson in Western methods of efficiency that will put them to shame," Nicholson asserts, completely contrary to what many less history-biased eyes would contend about the difference between Anglo-American and Japanese work ethics. Speaking of inefficiency and a lack of order, however, observe how William Holden's escape and subsequent arrival at a luxury field-hospital in Ceylon (now Sri Lanka) arrives to the viewer in a series of disjointed, episodic flashes. How did this guy go from being lapped up on a mid-jungle shore to walking around a beachside patio with a blonde nurse in his arms? Foreman and Wilson eventually get around to telling us, but Holden's own brand of Autopilot Actingthe furrowed brow, the granite expression, the clenched voicekeep us from being all that interested anyway. What happens, then, that turns The Bridge on the River Kwai around so drastically? It is wholly inevitable that Holden will be asked by Jack Hawkins' Major Warden to return as a field navigator and strategic attacker of the campsite from which he freed himself. The very confidence with which the audience awaits this development leads to further questions about why Lean takes over an hour to get us to that point in the story. Nevertheless, once the return mission has commenced, Kwai finally hits a reliable groove as a Heart of Darkness-type adventure through tough terrain and past lurking snipers. Hildyard finally stops filming the same long shots and straight-on closeups and finds some striking images like a parachute landing over the Thai forest canopy, the gleaming eyes of pitch-painted soldiers as they glide down a river at nighttime, and the radiant expression of a native peasant woman as she stands chest-deep in water and professes love through the one English word she knows. The pace picks up immeasurably, the shots are tighter and more varied, and we finally have something to care about: who of the four-man sabotage team will actually survive all the way back to Saito's camp, and at what level of peril to their fellows? 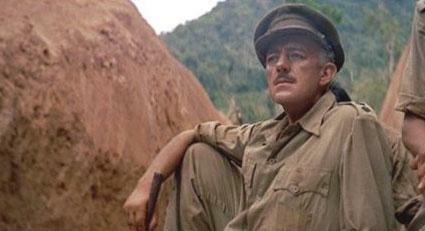 Even more gloriously, however, Foreman and Wilson emancipate Alec Guinness from his early position as the symbol of military integrity and popular leadership. Nicholson is so proud of the bridge his soldiers have constructed, so sure that the product of their labors will last, that he appears more enamored of this featwhich is, after all, a strategic gain for the Japanese, not the Britishthan he is of his ostensible as the campaigner for British interests. In other words, Holden, Hawkins & Co. are sneaking past creepers and riflemen to detonate a bridge that Guinness will do anything to leave standing. Once the Anglo-American forces have been ideologically divided in this way, The Bridge on the River Kwai is no longer the pro-Western, enemy-bashing old saw that it appeared to be for its first hour. Holden and Guinness are tantalizingly recast not as would-be allies but as emergent adversaries united only in their mutual capacity for zealous action. Even Hayakawa, who earned an Oscar nomination for his stern rendering of Saito, is a less predictable character once the British protagonists have been set in opposition; who will he now support, and how firm are his allegiances? Through all of these narrative maneuvers, The Bridge on the River Kwai assumes a feeling almost unheard of in World War II pictures, or in historical films in general: the ominous, enervating sense that anything could happen at any time. Meanwhile, the bridge looms ever larger in the background of Hildyard's shots, the simultaneous emblems of British accomplishment and Japanese interest and therefore an eloquent symbol of the film's delicate ambiguities. I do not want to suggest that Bridge in every sense improves as it continues. Guinness is continually saddled with overly rhetorical speeches that shout, "Actor's Monologue!" The sound effects in the sequence where plastic-gelatin explosives are bound to the bridge seem too conspicuous, too hard for the guards on duty not to notice. Lean also vandalizes the ending by killing off one character in a fashion as melodramatically offensive as Omar Sharif's florid heart-attack scene in Doctor Zhivago; worse, the way this particular moment plays out constitutes a too-neat avenue by which Lean escapes any final conclusion within the complicated themes of war he has deepened for the previous hour. Essentially, he mounts an appropriately impossible scenario and then bushwhacks a lazy and histrionic way out of it.